For the last two years I have organized a Christmas Craft Day at the school. The kids have a chance to rotate thru craft stations and make a bunch of crafts to take home. This year I have 6 classes participating (grades 1-3) around 120 kids. I have a team of volunteers who help run the stations but I need to come up with the crafts and test them out. This year we are doing 12 crafts. I plan on posting them all and maybe throwing in some of last year's as well. Here is Craft #1 Mini Christmas Trees. They are approximately 5 inches tall and very easy to make. The first step is optional. My husband pointed out that you really don't see the toilet paper roll so you don't need to paint it. I painted mine so I'm leaving this step in.....I don't think the kids at school will be doing this step but you can choose for yourself. Paint toilet paper roll or color in with green marker. Let dry. Using the printed out templates, trace onto felt. If you are using different colors decide where you want them to go. Cut out your circles. I find that when I use a marker to trace with I try to cut just inside that line. This way there is no black marks on the felt. Cut out 1 top piece as well. You now need to cut an x in the middle of each circle. Easiest way to do this is to fold circle in 1/2 and then in 1/2 again, make a cut and then repeat going the other way. For the large circles make your x cut about 1 1/2 inches long. As you work up to the smaller circles the cuts get a bit smaller. Felt has a bit of stretch to it and you can also clip it a little larger if needed. Take your top piece and place a little tacky glue on the bottom corner of one end. Curl the other end around and glue together. It should look like a little hat. Take your toilet paper roll and flatten it slightly on one end. Using you scissors cut the side from about 1 inch above the bottom to a point at the top. Do this on both sides and try to get them equal. Place a little glue at the point and glue the two points together. You can use a clothespin to hold it together while drying. When dry try to round out the roll again so the sides are so squished. You want the bottom to be in its original shape so it will stand up. Take your felt circles and start pushing them down onto the toilet roll. You don't need to glue them in place in fact it's better if you don't. That way you can position your tree branches just so. Place all the circles on. Smooth the circles down a bit so it forms a sloping tree shape. Put some glue in the top cap and place on the point. You may have to hold into place for a while or use that clothespin. Now you can decorate. I kept mine fairly simple as that is what the kids will be doing. I used some 5mm pony beads which kinda of look like lights, some pompoms, and a star at the top. I experimented a bit with a garland but found it a little fussy for the kids. You could use some glitter glue or sequins. There you have it. A mini Christmas tree that stands on its own using simple supplies. You can even make mini presents to go underneath. 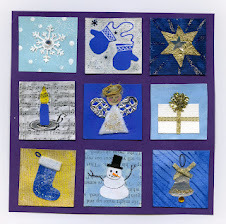 give it a try and I'll see you next time with another Christmas craft. I am definitely going to try to make these with my girls. You are so creative. Thanks for this! Looking forward to it! gail, i just love that little tree. it will be perfect for the "barbies", they have so many rooms in their house and a certain little girl i know likes to decorate each one! thanks for all of your great ideas. Thanks everyone. I keep trying to come up with some good projects that don't require a lot of expensive supplies.....good to know they are appreciated. This is beautiful, but I don't know if I'll get to it this year... you know, the list of projects keeps getting longer. I love this idea! I saw it at the crafty crow. I'll have to make one for our doll house. Hi! 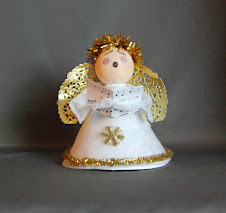 I was hoping to post a link to this craft and your angel clothesline on my blog, because I think they are such great ideas...I'd also like to put one image of each finished project borrowed from your site. I thought I'd post them now, but if you have any objections or suggestions, please leave me a comment, and I'll take them down immediately! 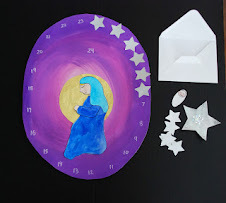 Very cool ideas--I especially appreciate the religiously themed ones--including the nativity silhouette. PS--I found you through the Crafty Crow! Love your blog, great creative ideas! Thanks! We had a blast making these! I posted about it on my blog and linked back to you. As I was putting together my site, I came across your delightful craft projects. I hope that I can work these craft ideas into my time with the family. Lovely...simply lovely. many thanks! tha is so cuuuuuuuute!!! 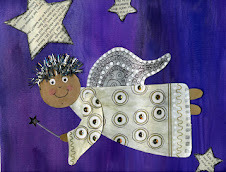 Thanks so much for this tutorial...I did this with my kids last week and linked to you today on my blog! Very very cute craft! Thanks again for sharing!! Thank you for your tutorial, it's so nice! I'll try to do it one myself. I love it! Thanks for sharing it. I'll try to do one!